Belated photo of the supermoon eclipse from January 20, 2019. Fifteen years and more than 45 kilometers… That’s pretty good for a rover that was designed to operate for about 90 days and travel one kilometer. 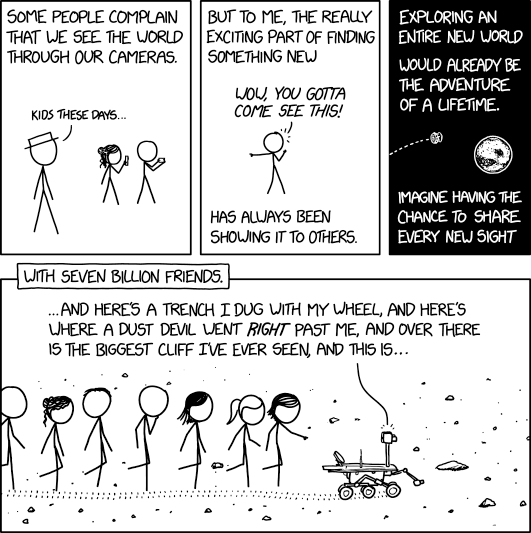 A very fitting XKCD comic to say goodbye. Thanks for bringing us along, indeed! At the beginning of this year, I ran across Alex Burke’s blog, while researching about film scanning. Among loads of other useful posts, I noticed Alex’ “The Bets Of …” posts, where he picks of 9(ish) of his best shots of the year. I really like this idea. It’s a great opportunity to go through all the photos I’ve taken over the year, remember and re-live some of the memories, as well as take a more critical look at the photos and make purposeful choices. I like the format of nine shots. It’s enough to capture the year, make a concise presentation, yet it’s small enough to force some contention and force critical look for the picks. Albeit, I took a slightly different angle and my picks aren’t necessarily the best picks, but they are the ones that mean most to me, be it because they are some of the best, or because they recall the best memories. We took our dog for a walk while visiting relatives, and found this lone alpaca in the field. The alpaca was sensing our dog, so I didn’t have much time to grab a shot. It’s a little oddly framed, but that’s partially why I like it. It poured for two days straight, but eventually we were rewarded by a beautiful sunset. Experimenting with my Kiev 80 camera and scanning film. Collection of ropes. Cannery museum near Prince Rupert, BC. Hiking steep trails on Haida Gwaii, BC. These goats are so much fun. I love their fuzzy beards and behinds. Shot on Fuji Pro 400H with Kiev 80. If you view what happened to the diplomats in Havana as an “attack,” you must look for something capable of producing such an assault. It would have to emit a sound that varied widely from listener to listener. It would have to strike only people who worked at the embassy. It would have to assail them wherever they happened to be, whether in their homes or staying at a hotel. It would have to produce a wide range of symptoms that seemed to bear no relation to one another. And it would have to start off small, with one or two victims, before spreading rapidly to everyone in the group. Thanks, fortune cookie! I’m ready to see what 2019 will bring. In agricultural applications, LED lights are used in ways that seem to border on alchemy, changing how plants grow, when they flower, how they taste and even their levels of vitamins and antioxidants. The lights can also prolong their shelf life. Don’t discard. Keep all your pieces in play. You’re telling me that there are three things you love and you want me to tell you which two to cut off…so you can limp along on the other one? This is not how things work. The advice I have for you is: don’t discard. Find a way to keep all three of these things in the mix. It seems to me, that if we love, we grieve. That’s the deal. That’s the pact. Grief and love are forever intertwined. Grief is the terrible reminder of the depths of our love and, like love, grief is non-negotiable. There is a vastness to grief that overwhelms our minuscule selves. We are tiny, trembling clusters of atoms subsumed within grief’s awesome presence. It occupies the core of our being and extends through our fingers to the limits of the universe. Within that whirling gyre all manner of madnesses exist; ghosts and spirits and dream visitations, and everything else that we, in our anguish, will into existence. These are precious gifts that are as valid and as real as we need them to be. They are the spirit guides that lead us out of the darkness. Imagine a horizontal line, with 0 on the left and 20 on the right. I want to be in the middle, at 10. But I’m at 17. No amount of adding will get me where I want to be. The adding mindset is deeply ingrained. It’s easy to think I need something else. It’s hard to look instead at what to remove. A big culprit: “sharenting,” or parents willingly giving away their children’s information, like name and date of birth. Those Facebook birth announcements may be posted with innocent intentions, but they can come with serious consequences. According to security experts at Barclays consulted for the children’s commissioner report, this leaves the door open to identity theft. The experts cited criminal reports where kids’ data was stashed away until they turned 18, upon which fraudulent credit card and loans applications were created in their names. Degrees of Freedom is an amazing article by Raffi Khatchadourian from The New Yorker covering some of neuroscience history and what it took to enable paralyzed people move robotic arms with their brains. For eighteen years, Jan Scheuermann has been paralyzed from the neck down. She is six feet tall, and she spends all day and all night in a sophisticated, battery-powered wheelchair that cradles her—half sitting, half reclining—from head to toe. Fall colours on Table Mountain near Artist Point, Mt. Baker, WA. Sun setting on peaks at the feet of Mt. Shuksan, WA. As the success of design has become measurable, it has transformed a handicraft into an engineering job. Not the master designer but the user is the arbitrator of good design. The key performance indicator is not beauty but profit. As financial and technical performance was gained, beauty left the stage. Now it feels like something is missing. Lately I can’t get enough of Snarky Puppy‘s We Like It Here album. I’ve been playing it on repeat for a couple of weeks now. Orange, pink, and purple sunset over downtown Vancouver and North Shore mountains, reflecting in a harbour. The new GitTower 3.x update is great, but unfortunately I can no longer recommend it as an alternative client. With the new release comes new subscription licensing – Don’t get me wrong, I’d be more than happy to pay for new versions or features, or even annualy, however, I can’t get behind a subscription model that disables the software completely when I stop paying. I would have no problem if it froze in time and stopped getting updates, but not the licensing model fournova chose. The real Frank Abegnale tells his tale in a talk at Google, and it’s ever as gripping as the movie. Surprisingly, the movie was pretty close and decently done. Make sure to watch the QA session at the end, he provides some interesting and unexpected answers. Is there something unique about today’s hits–artists taking fewer risks and creating a narrower range of sounds? In 1834, to get upper hand in trading bonds, the Blanc brothers bribed telegraph operators to introduce errors into the usual broadcast without affecting the message: a character with market direction followed by a “backspace”. They then observed one of the telegraph towers to learn how to trade faster than any other available means. Too often, [number stations] are described as “spooky,” “creepy,” or “mysterious,” and the discussion stops there. It may be disappointing to some, but these stations are not […] relics of the Cold War — rather, these stations are part of the sophisticated work of intelligence agencies and militaries, and they are very much still on the air. My Grandfather’s Memory Book is a touching story that brought back memories of my grandfather who was industrial designer, painter and cartoonist. My brother and I grew up browsing through his design notes, watching him draw cartoons for publications, and paint. He didn’t keep journals, but we have paintings, stacks of cartoons, and paper toys he made for us. Now that Instagram gives us some of our data back, I’ve imported all the photos back to my site. Here is the script I used, for those interested. NotePlan is another note taking app, but it integrates your calendar into markdown with notes and todos. You can create links between your notes and even create calendar events within markdown. Everything get stored in your iCloud drive as plain text files. The Facebook data export is pathetic. I thought the Instagram export was just so, but compared to Facebook’s it’s a treasure trove. Facebook timeline export is basically plain text formatted as html. No links or images, and some messages are duplicated or triplicated. LEX – Analog camera for E-mount lenses. A great behind the scenes story written by Michael Benanav about the photo insert in his book Himalaya Bound (on my reading list). Well, there’s one for the books… SmugMug acquires Flickr. I fell out of love with both services a while ago, but SmugMug is the right company to bring Flickr back to life. Sun setting over the Red Rocks Canyon National Conservation Area, Nevada. Number of the questions to Mark Zuckerberg in the Senate testimony were asking about data ownership and were quick to point out that the users don’t make any money off their data. Many people on social media were echoed the same. I believe these questions are short seighted and are looking at the problem from the wrong angle. It turns out that what I was doing was searching for calm. At the time, my head was like a badly tuned radio – I wasn’t really able to listen to what people were saying, but what they said hit home. When I was out taking pictures, concentrating purely on the creation of an image, my head started to unravel. Discovered two nice looking neutral type faces: Untitled Sans and Untitled Serif. Interesting Ars summary of two research articles on biology of depression and how ketamine affects it. Ocean sunrise from south east Baja California, Mexico. We’ve got to stop thinking of the internet as an extension of who we are, and start to realize that it’s an agent all its own, a nonhuman brain, in a way, that foists on us between the lines a cruel, unspoken agenda: It wants you to stay. The visualizations presented here highlight ways in which San Francisco residents’ perceptions of local spaces may not be reflected in standard maps. Interesting read and a fun thing to do with your own neighbourhood. My father was a very disciplined and punctual man; it was a prerequisite for his creativity…. No matter what time you get out of bed, go for a walk and then work, he’d say, because the demons hate it when you get out of bed, demons hate fresh air. Why not? If you don’t have enough information to make a statistically defensible decision, merely choose. Thanks for the Christmas gift @FastMail! Configuration profiles for all! Remote Hack of a Boeing 757 by Bruce Schneier. If DHS figured this out, others did too. Fun times coming to flights near you. Acute Solar Retinopathy: This is what happens to your eyes when you look at the eclipse without glasses. Transient is a compilation of epic slow-mo captures of lightning storms by Dustin Farrell. Well worth a watch or two. Last road trip of the year. The fall colors are amazing. Camping near Superior, MT. The 2017 Fall Foliage Map is the ultimate visual planning guide to the annual progressive changing of the leaves. GLACIER EXIT is a short documentary with amazing scenery, important message, and beautiful cinematography. Earlier this year, I released the Triggertrap Mobile Dongle hardware as open source, and today, the apps join the fray as well, with the source code for both our Triggertrap iOS app and our Triggertrap Android app now available for download from GitHub. …Death is nothing at all. It does not count. I have only slipped away into the next room. Nothing has happened. Everything remains exactly as it was. I am I, and you are you, and the old life that we lived so fondly together is untouched, unchanged. Whatever we were to each other, that we are still. Call me by the old familiar name. Speak of me in the easy way which you always used. Put no difference in your tone. Wear no forced air of solemnity or sorrow. Laugh as we always laughed at the little jokes that we enjoyed together. Play, smile, think of me, pray for me. Let my name be ever the household word it always was. Let it be spoken without effort, without the ghost of a shadow upon it. Life means all that it ever meant. It is the same as it ever was. There is absolute and unbroken continuity. What is this death but a negligible accident? Why should I be out of mind because I am out of sight? I am but waiting for you, for an interval, somewhere very near, just around the corner. All is well. After weeks of rain, sunrise this morning! One last hike, cleaning up after Fat Dog 120 2016. The autumn views are a good incentive. Great explanation of gravitational waves by PHD Comics. I like the simplicity of having a static site — it reduces the overhead of maintaining the server and software running it, copes with larger loads better, and opens up a myriad options for hosting that would otherwise not be available. The drawback, however, is publishing on the go, especially if computer access is limited. My criteria for a mobile workflow are similar to one on a computer: being able to work offline and publish once online, use Git to maintain the site, avoid having to SSH to edit or publish, and limit manual interaction with remote services as much as possible. Researchers at MIT’s Computer Science and Artificial Intelligence Lab have developed software that uses variations in Wi-Fi signals to recognize human silhouettes through walls. Is there anything inherently “doggy” about the word “dog”? Obviously not—to the French, a dog is a chien, to Russians a sobaka, to Mandarin Chinese-speakers a gǒu. These words have nothing in common, and none seem any more connected to the canine essence than any other. One runs up against that wall with pretty much any word. Except some. The word for “mother” seems often either to be mama or have a nasal sound similar to m, like nana. The word for “father” seems often either to be papa or have a sound similar to p, like b, in it—such that you get something like baba. The word for “dad” may also have either d or t, which is a variation on saying d, just as p is on b. People say mama or nana, and then papa, baba, dada, or tata, worldwide. Faint outline of Milky Way over the Tantalus Range, with cloud filled Squamish Valley, BC. You’re only making a mess by trying to put things straight. You’re trying to straighten out a wiggly world and no wonder you’re in trouble. Updated June 24, 2015. Altra Lone Peak 1.5 has been my shoe of choice for some time, but now that the supplies are close to non-existent and my own stash is dwindling, it is time to look for a replacement shoe. Lone Peak 2.0 would be the obvious choice, but I didn’t feel as comfortable in them as I did in the 1.5 (the toe-off doesn’t feel right). I decided to try out the Superior 2.0, as I’ve used Superior 1.5 for “everything” shoe including some short runs, and generally liked it, aside from the lack of any sort of lugs. Heads up: As a big Lone Peak 1.5 fan, my review might be a little biased and somewhat of a comparison between the two shoes. Storm is a' brewin'. On the way up to Sky Pilot, looking back at Tantalus Range. Bluebird day in Squamish, BC. Sky Pilot and Copilot mountains with some fresh snow. Simplenote has been my note taking app of choice for a while now, but recently I’ve been annoyed with missing features, weird UI, and lack of integration. iA Writer Pro (Writer Pro from here on) came as unlikely replacement, but I already owned the app and some of its features were perfect match for my needs. I’ve now been using the new setup for about a month, and so far so good. Layers. At Painted Hills section of John Day Fossil Beds National Monument in Oregon. Time Machine has been asking me to start new backups “to improve reliability” more and more frequently. Last instances were merely a week apart. I would typically go with the flow, as I have multiple backups, but as I found out, it may not be the best idea to blindly agree when prompted. After running the Oregon Coast 50k in late October, I had a few days to spare before taking off to Argentina, and I took a little detour on the way home. From Florence, I drove east towards Eugene and Sisters, taking the McKenzie Highway (OR 242) to see Dee Wright Observatory, and then the ultimate destination – Painted Hills unit of John Day Fossil Beds National Monument, near Mitchell. Star trails above the Deschutes National Forrest from Dee Wright Observatory. Mount Washington, Three Fingered Jack, and Black Butte are peaking on the horizon. I’ve seen a few discussions about iOS HealthKit recently, and most seem to miss the point of the app. There seems to be a notion that HealthKit is trying to compete with apps that do data visualization, that it somehow wants to take over managing all the wearable sensors, or even push Apple’s wearable fitness tech. While I don’t know what Apple’s intentions, all these assumptions don’t seem right and miss a major reason for HealthKit’s existence – to be an information broker. Did you know the average persons spends 4 years of his life looking down at a cell phone? After Apple announced they will stop developing Aperture, Adobe was nice enough to offer a Lightroom plugin to migrate Aperture libraries to Lightroom. I previously wrote some custom scripts around the Aperture library, and can appreciate how much pain they must have gone through to deciper the Aperture library database (hopefully they had some help from Apple). The Aperture libraries aren’t always consistent and can vary depending on how old they are, or how many times they crashed, so there were bound to be some bugs in the Aperture Importer plugins. T-10minutes to the next 32 hours of flying and airport life. Weee?!? The new bionics that let us run, climb and dance. Fat Dog 120 finish welcome committee. Do you know why we went to the moon but never went back? Why did we stop dreaming? David Kwong shows us how we’re wired to solve. For a typical time-series data, one would use the d3.time.scale scale. This scale, however, does not work for plotting non-uniform time-series data (for eg. market data) where weekend days show as gaps and are undesirable. One of the highest pleasures is to be more or less unconscious of one’s own existence, to be absorbed in sights, sounds, places, and people. There is no problem so bad, that you can’t make it worse. Sunrise over Vancouver's north shore. Cloudy sunset over downtown Vancouver. Three of my polaroids will be at the Project Impossible Canada V1.0 show at PhotoHaus Gallery October 25 - November 1. Opening Oct 25, at 7pm. 14 West 7th Ave, Vancouver. People take different roads seeking happiness. Just because they’re not on your road doesn’t mean they’ve gotten lost. View of Vancouver lit up in evening glow. Cypress Mountain viewpoint, Vancouver, BC. The only Zen you’ll find on mountain tops is the Zen you bring up there with you. Early morning view of downtown Vancouver from Lonsdale Quay, North Vancouver. I’ve previously driven to specific spots or short sections of the coast, but never as a whole. After years of wanting to do the full length of it, I finally got around to driving it all in the fall. Instead of wondering when your next vacation is, maybe you ought to set up a life you don’t need to escape from. A guide to understanding the introverted. Polaroid OneStep 600 camera, TIP PX 680 Color Shade film. Fitzsimmons valley. Heading to 5peaks. I was doing an evaluation of my decline and i was sort of charting it on this graph in my mind. And it ended, hit bottom long before Auburn. And I thought is there any possibility I can make it to Auburn? I thought no. No, that’s ridiculous. Its ridiculous for any of us to even think of that. Well, how about Michigan Bluff? And I thought across those deep canyons, no way. Well, what can I do? I just asked myself that question. And the answer came to mind; I can still take one more step. And so at that point I decided I would take one more step until I could no longer take one more step. And today we would say that’s suicidal, we tell people not to think that way. That there is always another day, just come back. Well, there isn’t always another day. There are times when life gives us one opportunity at something. 180° South is a documentary about Jeff Johnson’s inspiring adventure to Patagonia, Chile, following in the footsteps of Yvon Chouinard and Doug Tompkins. Instead of driving down south, though, Jeff sets out on a set of adventures, including becoming a crew on sail boat and ship wrecking off Easter Island and surfing the longest wave of his life. Along the way he meets interesting people, tells inspiring stories, and shows breathtaking images from places others only wish they could visit. Timelapse made from footage of Hitchcock’s Rear Window movie. Earth is a timelapse view shot from the International Space Station. Windows network stack uses “miniports” to handle different layers of the network. These can sometimes “break” and cause VPN and possibly other network level services to not work properly. Usually you can tell a miniport is not working when it has an exclamation sign icon next to it in the device manager. (The miniports are typically hidden too, so if they aren’t broken, they won’t show up at all.) To me, this problem manifested when I was creating a VPN, and despite choosing connection over network, the connection would try to dial the modem. One of a kind photo. Check out the whole set on ESA’s photostream. Fireworks, comet, and lightning in single exposure. Interactive Exploration of a Dynamical System. This is the proper way to teach differential math. Is Your Brain Sleeping While You're Awake? Cracking two SHA1 keys every seven minutes, at $2.10 an hour. Does Mr. Jekyll have a new twin? Jekyll and statically generated pages are nice, but it would be nice to create some posts while on the road without the laptop. SSHing to the server is an option, but typing up a post in vim on phone is not exactly enjoyable. I use Simplenote all the time, and I figured it would be nice to write posts in Simplenote. Using Simplenote’s API, I wrote a quick and dirty script that pulls notes with a blog tag and writes a file that Jekyll can process. Hello from Simplenote, automatically downloaded through the Simplenote API, and processed with Jekyll. socat, self described as “multipurpose relay,” is the swiss army knife of any kind of bidirectional data transfer. So much cooler than netcat and lot of other similar tools. I’ve always missed decent way of adjusting photo time in Aperture. The normal Batch Change only allows you to change time-zones, which is almost always useless if you are like me and don’t adjust your camera for daylight savings, or have camera with wrong time. Google Maps: "Kayak across the Pacific Ocean ... 6243km"
Trying to figure out the flight distance between Shenzhen, China and Vancouver, BC, I plugged the two cities into Google Maps (not realizing there are no flight paths there, at the time). I did not get what I wanted, but the outcome was interesting: They give me driving directions to a port, and from tell I’m supposed to “Kayak across the Pacific Ocean”, about 6243km to Hawaii, and then kayak another 4463km to Seattle, and drive up to Vancouver. Ok then, I’m right on it, see you in couple of years. I wonder though, is the kayaking part something they are working on or part of the biking maps? While developing an application, I had the need to access Active Directory (AD) that was running on a remote machine with no access to AD from outside world. The only option to talk to the AD was via Window’s VPN.